Las Vegas/Mechernich. 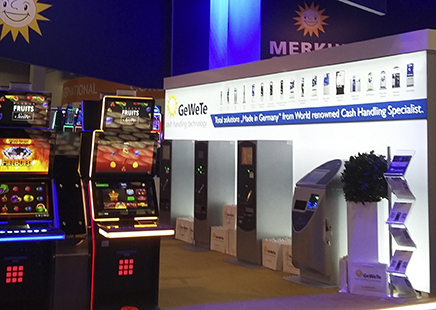 In conjunction with Merkur Gaming, GeWeTe once again had a number of change machines / bill breakers / ticket redemption machines on the stand at G2E 2017, showcasing part of the range from its extensive portfolio of cash handling solutions. With more than 24 years of experience in cash handling, the German-designed and built highly secure models featuring full management system and audit reporting offer a vast range of solutions for many applications worldwide. To date, GeWeTe has over 60,000 machines installed around the world and has built a reputation for supplying and supporting the full portfolio regardless of location. The range included the ever popular Cash Centre Compact - Casino with its large-volume banknote cassettes offering a capacity of up to 12,000 notes across four cassettes, which also features coin dispensing and ticket purchase/redemption, as well as a change machine and bill breaking, all in one secure machine. GeWeTe also had two variants of the Cash Centre Compact on display, both of which are compact low-cost bill breaker, change machine, ticket redemption models. 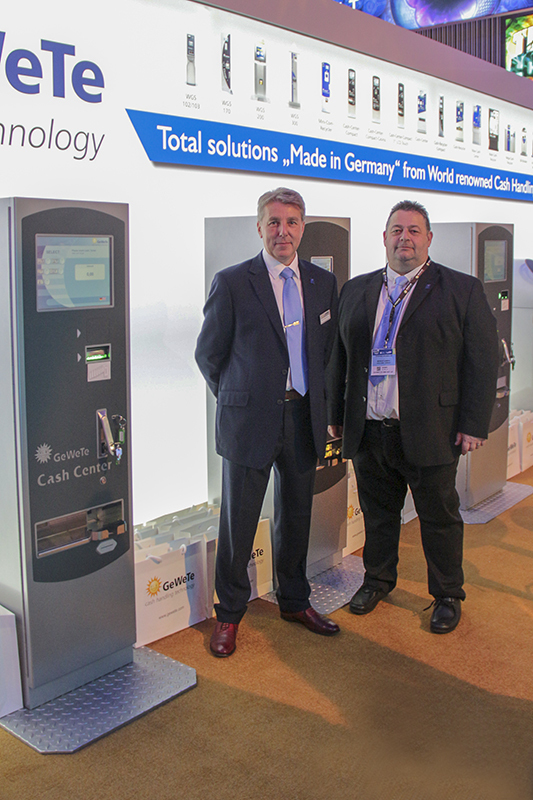 In addition to the dedicated area of the stand for cash handling solutions, GeWeTe also had a Cash Center and Cash Center Compact for cash handling in the sports betting segment, demonstrating a fully automated, quick and discreet ticket redemption kiosk with live connection to its host system. This model can also be used as a change machine and bill breaker. Considering the horrific situation in Vegas on the Sunday before the show, the visitor numbers to our stand were fantastic across the three days. Year on year, we are seeing more enquiries from customers around the world who attend the show and with our on-going support at a number of shows in America and Southern America we are building up a reputation and new customer base, which we look forward to expanding in the near future. Together with the Merkur Gaming teams from across America and South America, Mark Edmundson, Sales Manager from our UK office, was at the stand offering his assistance. With over 30 years of experience in cash handling, he was able to share his knowledge of GeWeTe’s solutions and demonstrated suitable models in response to the wide range of visitor requests. We look forward to working with the Merkur Gaming team in the future.